The John Lennon-Paul McCartney canon has been recorded by everyone with the possible exception of "Honey Boo Boo" and "Mini Me." Some of those efforts are feckless attempts at moving the popular-genre so far away from its source it is laughable. 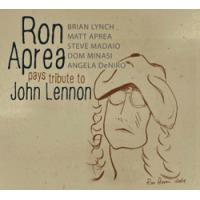 Saxophone artist, Ron Aprea had the unique opportunity (along with trumpeter Steve Madaio, he of Stevie Wonder and the L.A. studios) to record with John Lennon on his post-Beatles award-winning album, Walls and Bridges (1974, EMI). Aprea hasto this dayhad a special attachment to Lennon and for the Lennon-McCartney library. 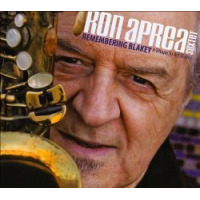 And, with this stellar jazz-infused effort, Aprea has gathered some of the finest jazz musicians around and ultimately delivers a very worthy tribute. Following Aprea's soulful lead on the up-tempo opener, "Let It Be," jazz trumpeter Brian Lynch rides in and delivers work that soars and invigorates material we have heard for decades. Madaio also pitches in along with Aprea and lush strings with a tasty "Imagine." Aprea's saxophone is soulful, sassy-not-saccharine sweet and replete with technical artistry ("Yesterday"). His alto sound emanates from coarser, blue-ish stylings and his soprano take on "Norwegian Wood" is indeed "a favorite thing." Shrewdly, Aprea's charts dare not to either re-create or re-hash the branded material. However, his pen is slick enough to dust off the tunes and deliver them with swinging sheen. "Can't Buy Me Love" has blue-groove shadings extracted from the Bank of Count Basie. The strings here are led by violin virtuoso Matt Aprea and are superior ("Here, There and Everywhere"). "Blackbird," rendered Duke Ellington suite-like is the hit of this hit recording. The bird is charted and served piping hot. "Whatever Gets You Through the Night" is caliente Latin with Aprea wailing away over strings and knifepoint-sharp horn bites led by ace lead trumpeter, Bob Millikan. "Goodnight" puts things to rest with Aprea's solo chants along with Angela DeNiro's meticulous and moving lullaby vocal duet with Dom Minasi's guitar. It is stunningly gorgeous. A jaded ear might pass by yet one more Beatles retrospective. However, they'd be losing a marvelous opportunity to imbibe glorious, vintage wine here by way of newly-honed crystal glasses. Track Listing: Let It Be; Imagine; Norwegian Wood; Yesterday; Happy Christmas; Can't Buy Me Love; Here, There and Everywhere; Blackbird; Something; Fool on the Hill; Whatever Gets You Through the Night; Goodnight.